It has been raining A LOT over the last few days, so the fishing has been tricky. I went over to the river the other afternoon to find it bank high and coloured so after a couple of casts with a Mepps in hope of perch or chub I simply packed in. To cut a long story short I had been feeling slightly deprived of my sea fishing. 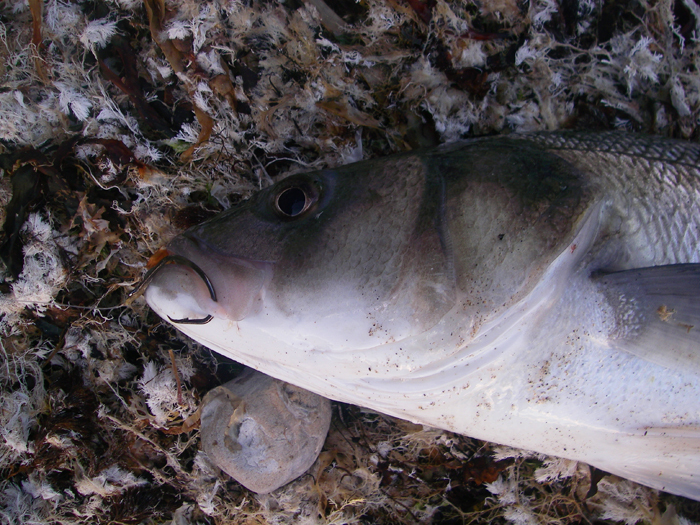 The last spring tide session was not exactly thrilling even though I managed a couple of schoolies and a number of modest wrasse on the baited spinner. My pals using more conventional lures had been fishless. Anyway, I'd just spent the day shopping and doing the garden so, when Lilian said she was going to do some work on the computer after tea, I took it as a signal that I could go fishing. By now it was 8p.m. so I grabbed a couple of last year's mackerel fillets from the freezer and put the poly bag in hot water to try and soften them while I donned my gear. The fillets were slow to thaw and well stuck together. I was in a hurry so as I left the house I tipped a bit of the hot water into the poly bag to try and accelerate the de-icing process. By 20:30 hr I was on the beach and ready to start fishing. There was a bit of an onshore breeze and the sea was filthy and full of bits of weed in the margin. I had the Surepopper rod already set up. The 'rig' was simple with just a snelled, freelined 8/0 circle hook on the 15lb, clear, Amnesia trace. The hook was a new one to me and the finest wire 8/0 circle I've found so far. I took the biggest fillet from the bag. It was soft. Too soft! As I hooked it on (via its thin end) I realised that the hot water in the bag had been a mistake. I shoved the point of the big hook through the skin twice but the fish was barely hanging on. This needed care. I cautiously and gently swung the rod and the bait dropped about five metres out - still attached. I stood at the water's edge with the waves lapping my boots and took a couple of turns on the reel to keep the braid out of the weedy margin. I opened the bale arm and holding the rod in my right hand took the line between the finger and thumb of my left. I wasn't too optimistic following a couple of recent bait fishing blanks (it's amazing how it can knock your confidence). Five minutes passed and, much to my surprise, I didn't seem to be having any trouble keeping the bait out there. Often bits of weed drape themselves on the line dragging it down into the water but not this evening. Suddenly the line was streaming out through my fingers. At first I couldn't believe it. Faster and faster it went, it was certainly a fish. Now for the moment of truth. I dipped the rod tip to give a few inches of slack as I closed the bale arm and hung on. The line pulled tight and the rod bent. I was in! The clutch was buzzing as the fish dragged off braid against a pretty tight clutch. It slowed down and I began to slowly pump it back. It ran again. 'Don't come off!' I'm thinking. It didn't. Before long I saw a boil close in and a big silver-grey head showed above the surface. I stepped back and eased the fish onto the gravel at my feet before walking down and picking it up. Grab the camera, take a couple of pictures, remove the hook from the scissors, measure it- 68cm, carry the fish down to the water's edge and slip it back. Almost immediately it thrashed its tail and darted away into the murky water. Phew! I went to get the other bait for another try. By now it was even softer than the first one had been. I nicked the hook in, through the skin twice and out again. Carefully does it Mike. 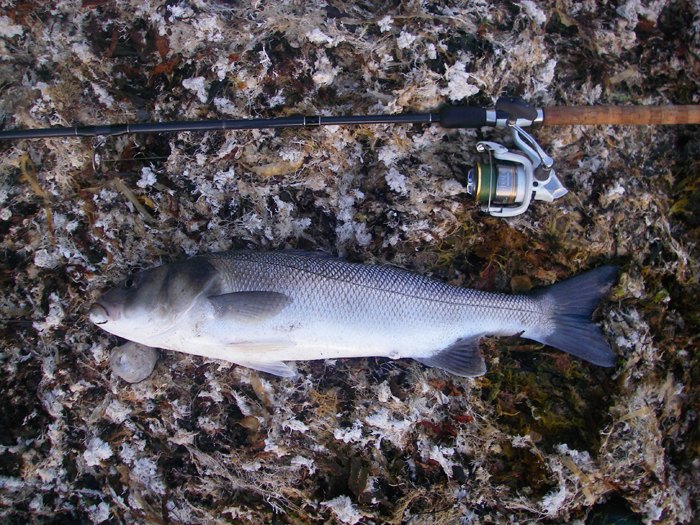 I swung the rod in a gentle arc and watched as the fillet flew off and plopped into the sea a couple of metres out. Now baitless, I went home. Not a bad bass - well over 3kg. Couldn't be better hooked on my 8/0, Tsunamipro Black Circle hook.